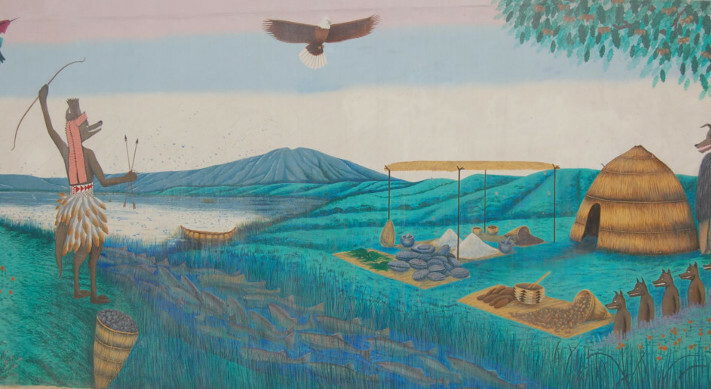 The creation story panel of the Ohlone Mural. The world they created was made on Mount Diablo by Coyote, Eagle and Hummingbird. Ohlone Park, a ribbon of open space that runs through the busy edge of central Berkeley along Hearst Avenue from Milvia at the East end to Sacramento Street at the West, unites one of the City’s oldest neighborhoods near the downtown. Created in the late 1960’s as a result of the BART tunnel which runs below it, the park today includes four children’s playgrounds, a nationally recognized dog park, a four-sided mural commemorating the Ohlone legacy, a basketball and volleyball court, softball and soccer fields, a community garden, and numerous open spaces valued by families, athletes, residents and nearby workers looking for a quiet space to eat lunch. The Park’s length connects the UC Campus to the North Berkeley BART Station, and it is a vital link between the north/south Milvia bike route, soon to become a cycle track, and the long-established Ohlone Greenway path running north to El Cerrito. Pedestrians and cyclists commute via the park throughout the day and night. As the population in downtown Berkeley increases, Ohlone Park will carry an increasing burden. It requires a comprehensive well thought-out vision to meet the needs of its community and the City. Friends of Ohlone Park has been established to preserve, protect and enhance the functionality of the Park in all its diverse uses and to recognize and honor the Ohlone people for whom it is named. For a year we have been meeting and consulting with our neighbors to evaluate current needs and challenges. In 2016 we joined Berkeley Partners for Parks and a member of the FOOP Coordinating Team (CT) sits on the Board of BPFP. In 2016 we completed a weeklong survey of trash containers to aid the city in assessing the needs for garbage removal. And, to provide safety for nighttime transit through the park, we completed a whole park survey of lighting to provide the city with information on malfunctioning lighting and to note dark areas that could introduce safety concerns. We regularly maintain communication with the Parks Department and the Parks and Waterfront Commission regarding improvements to the park, like the upcoming 2019 rehab of the Basketball Court. More recently, we conducted a very successful online survey of the residents near the park to determine attitudes and suggestions regarding the establishment of a permanent restroom for the park. City officials have been impressed with the response from our survey that demonstrates that the neighbors of Ohlone Park are concerned about the improvements to Ohlone Park. In its short history, FOOP has demonstrated to the City that we are a citizens’ organization that needs to be included in all future plans for Ohlone Park.